Pune, February 15: Neha Tripathi and Saaniya Sharna dropped crucial shots right at the end of their second round but still managed to keep a share of the lead in the fourth leg of the Hero Women’s Pro Golf Tour on Thursday. The two experienced golfers, Saaniya (73) and Neha (74) are now tied at the top at 7-over 151. 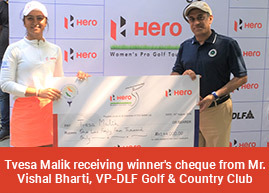 The duo is one shot clear of Tvesa Malik (75) and Suchitra Ramesh (74) who have a total of 152 each. Saaniya seemed all set to take sole lead when she came to the 18th tee but she dropped a double bogey. Meanwhile, Neha dropped shots on 16th and 17th and fell to 74. Saaniya earlier dropped a shot on 16th and had a birdie on 17th. Saaniya and Neha started with four pars each but after that the former had one birdie and one bogey, and turned in even par. Neha had three bogeys and two birdies to turn in one-over. On the back nine Saaniya and Neha shot 37 each. Saaniya had two birdies, one bogey and one double, while Neha had one birdie against two bogeys. While Saaniya and Neha had problems finishing, Tvesa and Suchitra finished strongly with five good pars each on last five holes. Tvesa may well have had a share in the lead but for a double on the 12th and another bogey on 13th during her 75. Suchitra Ramesh dropped two bogeys against one birdie on the front nine. She was even more steady on the back nine with just one bogey and the rest were pars in a card of 74. Smriti Mehra (76), Millie Saroha (76) and Gursimar Badwal (78) occupy the fifth to seventh places. Gursimar, who won the last event but is facing problems this week, had another indifferent day with a round of 78. Tavleen Batra who was one of the three co-leaders on first day shot 85 and fell to eighth place. Siddhi Kapoor (84) was ninth while Mehar Atwal (80) and Ayesha Kapur (82) were tied 10th. Khushi Khanijau and Trisha Sunil will tee off first on the final day, with Sonam Chugh and Anisha Padukone in the second group. They will be followed by Afshan Fatima, Ayesha Kapur and Mehar Atwal, while Siddhi Kapoor, Tavleen Batra and Gursimar Badwal will play together in the fourth group. Saaniya Sharma and Neha Tripathi will have Suchitra Ramesh as their third playing partner in the lead group, while Millie Saroha, Smriti Mehra and Tvesa Malik will be in the second to last group.